Saturday was week 10 of my Chicago Marathon training, and I was supposed to do 16 miles. 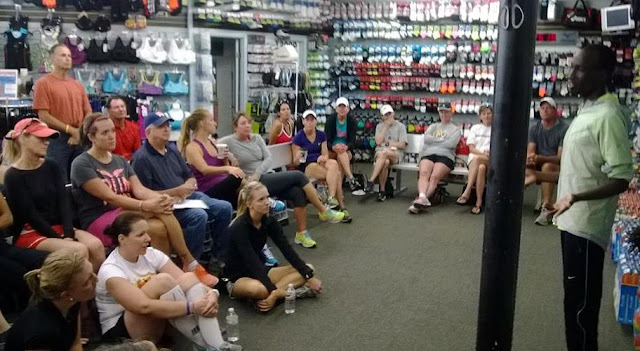 I found out that Wesley Korir, the 2012 Boston Marathon winner (he also won the LA marathon twice), was coming to speak at a local running store. He also attended University of Louisville, so that was really cool! I did not want to miss that, so I woke up at 6 am and was able to get in 9 miles. I was planning on doing 7 more after hearing him speak. The guy in the very back row, seated, in the red shirt is his coach. He wears Nike minimal shoes. Honestly, I was a little surprised at how tiny he is! I was thinking he'd look more like Usain Bolt, tall and muscular. He has a hard time keeping weight on. During the Boston Marathon, he lost 13 lbs! (Not during training, that's during the actual race!) That would be such a nice problem to have! He is such a nice guy. Very down to earth and friendly. So inspirational! One thing he said that really impacted me was to focus on your strengths, not on your weaknesses. So often we put so much attention on our weakness, that it can often pull down our strengths. We need to focus on what we do well. Believe in yourself and your strengths! He told us about moving to the US, from Kenya, and he had a very hard time getting here. A lot of complications at the airport, etc. After going through so much trying to get here, he called his brother, back in Kenya, and told him he was going to turn around and go back home. His brother said "do you know how lucky you are to go to America? Everyone wants to go to America, and you actually get that opportunity!" His brother told him to man up, and he said he did! He compared that to training for marathons. During our long runs it can be painful, mentally and physically. Sometimes we feel like giving up, but we have to keep going. Don't give up on yourself! Then when you finish the race, you'll be glad you didn't quit. His coach was also there and spoke for a few minutes. His love for Wesley is obvious. He shed some tears as he was talking passionately about Wesley's attitude and how he gives 100% and strives to always do his best. Wesley also talked about his foundation, the Kenyan Kids Foundation. In Kenya, you have to pay to attend high school! So they provide scholarships to students who otherwise wouldn't be able to go to school. His wife Torah and 2 adorable children were there too. Torah just wrote a children's book and all proceeds go towards the foundation. I am so glad I was able to meet him. He definitely inspired me! I had planned on going back to finish my 16 miler, but plans changed, and the hubs and I went to see some friends who just had their first baby. I just can't get away from babies! I did get a few more miles in last night, which was nice. What a great experience that must have been - so cool! That sounds like such a great opportunity to meet him! I thought at first he let you hold his baby lol! This weekend, I skipped my run completely :( I just had too much going on, and it was "only" four miles, so I figure I can add a few miles to my shorter runs the next few weeks to make up for it. It was awesome meeting him! Hope you can get that 4 miles in! I know it!! He needs some food! Lol! That's so cool that you got to meet Wesley! And losing 13 lbs during a race... that's pretty ridiculous lol! This weekend, I enjoyed the weather and went on a long bike ride on Saturday. On Sunday, I did my long run of 16 miles. Ahh, sounds like a wonderful weekend. And great job on 16 miles!! I have never heard a high caliber marathoner speak and think it would be so interesting and inspiring. Sometimes I wish I had trouble keeping weight on! Ha! Wow! What a fun experience. Your post about it was inspiring, so I can't even imagine how great it would have been to be there in person.